"It's an odd thing to admit, but in a perverse sort of way, I actually miss the wretched river, the rancid flow of puerile, nasty, sickeningly homophobic email I used to receive on a regular basis from the ultra-right and the Christian right and the Mormon right and the Bush-impaired whenever I would post a friendly, pointed column full of tangy liberal attitude. . . . . Oh, I miss all the lovely and positive email too, which outpaced the nasty stuff by a huge margin. But the hate mail was very special indeed, great fodder for live readings, for the reaction of horrified disbelief of anyone who saw it, for the charming reminder of just how ugly and violent and grammatically challenged the human animal can be." January 18, 2009 | Jared Quayle -- ask any Utah State basketball fanatic who this guy was at the beginning of the season and you would have maybe 1 of out every 50 people know about the Western Wyoming Community College transfer. Ask those same 50 people now and they'll tell you things about the rising star Quayle's own mother doesn't know. At the end of last season Aggie fans moped about their business, not sure if they would ever recover from losing their most cherished son, the oh-so-holy Jaycee Carroll. To his credit Carroll was an amazing shooter averaging 22.4 points per game, he also led the nation in three-point shooting at 49.8 percent, and he was third in the nation at free throw shooting with 91.9 percent. But isn't there more to a great player than records and the ability to knock down one out of every two shots from behind the arc? Right now Aggie fans are hoping Quayle has that little something extra to boost USU to the next level, to take the Aggies somewhere even the all-mighty Jaycee Carroll couldn't take them . . . beyond the first round of the NCAA Tournament. This feat has eluded Utah State for years. In 17 NCAA Tournament appearances, stretching from 1938, when Coach E. Lowell Romney took USU to their first tournament, appearance all the way to Coach Stew Morrill's five trips to "The Big Dance," USU has only come out with six wins. The Aggies' deepest trip into the brackets of the tournament came in the 1969-70 season when USU probed into the unknown world of two NCAA wins only to get crushed in a devastating 79-101 loss to UCLA. 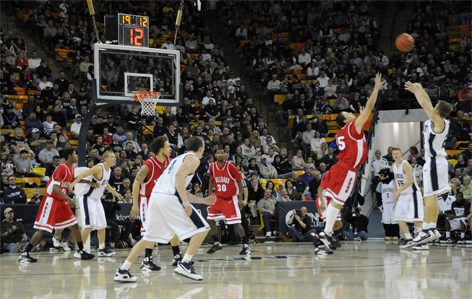 Quayle started the 2008-09 season slowly, coming off the bench for the Aggies in their pre-season games. After-all it's a well known fact that adjusting to and learning Morrill's plays can be hard, taking players seasons on the bench to learn the system. Students around the Spectrum expected Quayle to spend the season coming off the bench playing shooting guard when Tyler Newbold needed a rest, and playing point when freshman Jaxon Myaer came to the bench. He would contribute when and where he could and develop as he came to terms in his first year with Morrill's system. Early on Quayle was consistent, contributing just as expected, playing anywhere from 18 to 30 minutes a game and scoring four to 10 points. But then on Dec. 17, when USU students were scattered across the country waiting at their parents' homes for jolly old St. Nick to pay them a visit, Quayle broke out, scoring 23 points in 26 minutes. Since then he hasn't looked back, scoring in double figures in every game, save Louisiana Tech, where, let's face it no one played well. Quayle has led the team in scoring in four games, and has led in assists and steals in five games since that cold mid-December night in Southern Utah. In Thursday night's game against a tough opponent, Fresno State, Quayle showed those fans who still mourned over the loss of Carroll that little Orphan Annie was right, the sun will come out tomorrow. He showed just how clutch he can be, scoring a team-high 21 points while hitting four three-pointers, the last of which came at a crucial moment late second half making it a two-possession game. With 2.5 seconds left, Fresno State having closed the lead to two points, made the grave mistake of intentionally fouling Quayle. As a reporter for both the Hard News Café and The Utah Statesman I was able to sit literally inches from the baseline as Quayle took his two free throws. As I looked through the lens of my camera and framed Quayle as best I could, two things amazed me. First, after playing 35 minutes of hard, physical and fast-paced basketball, Quayle's face looked dry, no sweat pouring off his nose like Shaq or LeBron. He was calm, composed, ready. Second, after stepping up to the line and doing his ritual dribbling, Quayle never once looked away from the rim, although 10,000 people plus were looking just at him, arms raised and breaths held -- it was like he couldn't see them. The first shot swished through the net, and the "whoosh" came from the crowd as their arms fell. Quayle had just put the team up by three, sure it was better than a two point lead but with number 30, Sylvester Seay, who scored 32 points for Fresno State, on the court for the Bulldogs it was little comfort. Quayle got the ball back, dribbled and looked up; once again it was as if the Spectrum was empty, only Quayle and the rim. He took his shot, with Newbold and Williams waiting in the backcourt, along with thousands of students their arms raised. The ball rose from his outstretched fingers and fell straight through the net, not even bothering to tease the crowd by bouncing across the rim. The crowd, as if each individual were playing their own game of Operation, let their arms fall, whooshed and then erupted, as if they had just removed the broken heart from the game board without touching the sides, without the lit-up red nose or the buzz of defeat. There was no way the Bulldogs could overcome a four-point deficit with less than three seconds -- not even the dreaded Sylvester Seay could pull his team out the this, the crowd knew it, and the Aggies had won. Could Quayle be the Aggies' knight in shining armor, riding on his "Mustang" from WWCC, to finish his quest for glory on a "Big Blue" bull? Aggie fans can only cross their fingers, pray to their holy Jaycee Carroll, and wait, wait to see if Jared Quayle can lead Big Blue forward to slay the Panthers of Pitt, the Deamon Deacons of Wake Forest, and the ever-present Tar Heels of North Carolina. Will he vanquish the curse that has so long plagued Utah State basketball? Only time will tell.